I know I put up some photos of the Perseid meteor shower a couple of days ago, and again Monday. But c’mon. Look at this! A rain of ice from space. It was taken by astrophotographer Brad Goldpaint (who has been featured on this blog many times) on Thursday. 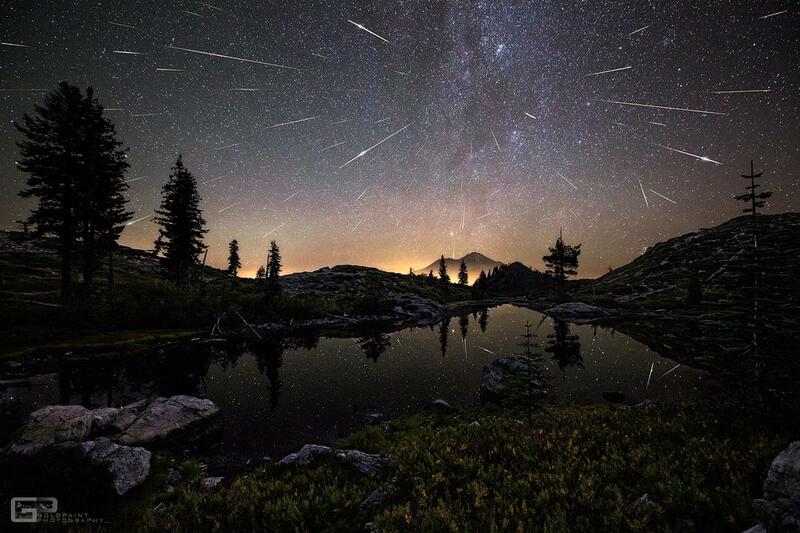 It’s a composite of photos he took at Mount Shasta in California over the course of four hours during the shower. As you can see, they all appear to radiate away from one point in the sky: The “radiant,” in between the constellations of Perseus and Cassiopeia (technically within the border of Perseus, hence the shower name). Well, almost all of them do. You can also spot a couple of random, sporadic meteors. That’s not surprising; on a normal night the Earth gets hit by 100 tons of cosmic debris anyway. You’re bound to get a few of those meteors during a shower. That photo is available to buy from Goldpaint, too. Bonus! In the earlier article I had a photo taken by Rogelio Bernal Andreo of the shower from his location in Hawaii. I mentioned that one of the meteors created a persistent train, a long-lasting vapor trail after it disintegrates. Andreo created a time-lapse animation of it, and you can see it flare brightly, then the vapor blow away. Cool. Now I can’t wait for the Leonid and Geminids!